Have you been using Inbox by Gmail for some time now? Have you been creating reminders, marking reminders done, using Google Now to create reminders? Do you ever need to find the reminders in Inbox by Gmail that have not been completed? It's actually very simple to find these. 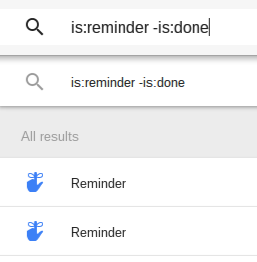 As you can see in the screen shots, just type in the search box "is:reminder -is:done" and you will have all the pending reminders, including recurring. With checking reminders and viewing past reminders, I find it easier to simply click on the 3 bars (top left) then, in the drop down, click reminders and there we have all the relevant reminder information.